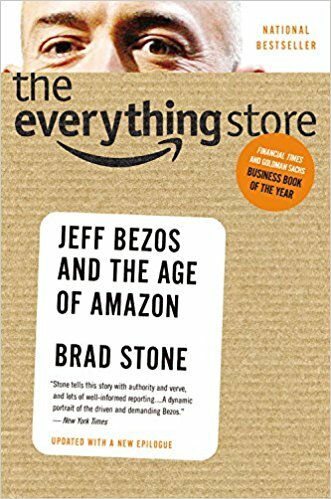 I really enjoyed Brad Stone's The Everything Store: Jeff Bezos and the Age of Amazon. Anyone who wants to better understand the dynamics of disruption or just gain a better understanding of the website we've come to love, must read this book. I read 1 year ago The Everything Store: Jeff Bezos and the Age of Amazon by Brad Stone and I had just started my own business. Most books you read about American entrepreneurs are so inspirational and it makes it seen so easy to work for a startup. This book shows you however the flaws of the leader, the leader and the business's weak moments, the principles of frugality, the way he celebrated his team but also split with some of them, the tough decisions. Some of these really inspired me on how to move further and I got some nice and highly applicable ideas from the book. One of my favorite books is The Everything Store, which is the story of Amazon. I really, really like company biographies. They're just kind of the style of book that I've gotten really into. These books all tell the tale of starting a company or building a product and despite covering a time span of 30+ years and multiple generations of technology the remarkable thing is just how very, very similar they are. While the technology changes, the process of creating something from whole cloth doesn't. That's a great lesson for people to learn. This was an amazing glimpse into one of the most disruptive companies in history as well as the past and future trajectory of e-commerce and retail. It is also a testament to unwavering self-belief. The thing that impressed me the most is that Jeff Bezos intentionally built an entire department dedicated to making his primary business obsolete which allowed him to take the lead in the next development, e-books. His foresight is extraordinary and he is an inspirational big thinker. Amazon is going to rule the world unless governments decide to break them up. It just makes sense to understand the most powerful company on the planet. Also, there is a (small) chance that Amazon sets up HQ2 in my hometown (Pittsburgh). If I read a biography by a business titan or prime mover and he/she recommends a particular title, I would read it next. For example, I found out about Sam Walton's biography from Jeff Bezos quotes in The Everything Store by Brad Stone. They're both great books to read if you're in eCommerce or Retail, answering your earlier question. The Amazon book comes out, the Google book comes out and then the AirBnB book came out and the Uber story came out, so whatever company is new or a big hit will eventually get their bio. That’s always excites me and I do enjoy those. The definitive story of Amazon.com, one of the most successful companies in the world, and of its driven, brilliant founder, Jeff Bezos. Amazon.com started off delivering books through the mail. But its visionary founder, Jeff Bezos, wasn't content with being a bookseller. He wanted Amazon to become the everything store, offering limitless selection and seductive convenience at disruptively low prices. To do so, he developed a corporate culture of relentless ambition and secrecy that's never been cracked. Until now. Brad Stone enjoyed unprecedented access to current and former Amazon employees and Bezos family members, giving listeners the first in-depth, fly-on-the-wall account of life at Amazon. Compared to tech's other elite innovators - Jobs, Gates, Zuckerberg - Bezos is a private man. But he stands out for his restless pursuit of new markets, leading Amazon into risky new ventures like the Kindle and cloud computing, and transforming retail in the same way Henry Ford revolutionized manufacturing. The Everything Store will be the revealing, definitive biography of the company that placed one of the first and largest bets on the Internet and forever changed the way we shop and read.